"Despite tens of thousands of people filling the Capitol and spilling out onto the grounds of this Capitol for nine days, we have seen no significant legislative movement since last Friday." Priest says this doesn’t mean the union is giving up their efforts for additional school funding, but rather turning its attention toward election season this November. She says teachers, and the people of Oklahoma must support legislative candidates who will increase funding for education, and vote out those who will not. The Oklahoma Public Employees Association announced earlier in the day they will end their walkout as well, saying they feel their needs have been ignored by both lawmakers and education advocates. 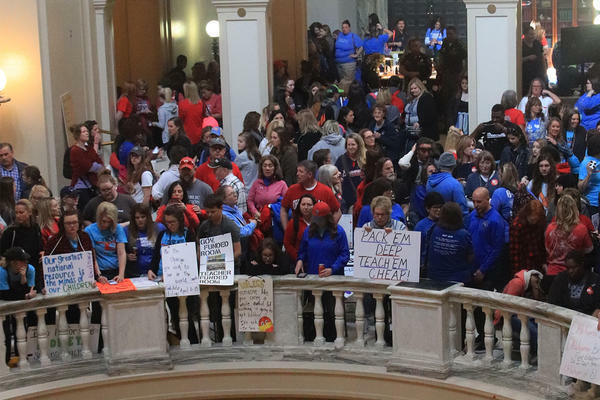 Oklahoma lawmakers say they’re looking for a way to end the now nine-day teacher walkout, but are getting mixed messages about what it will take. Senate Majority Floor Leader Greg Treat says he's met with leadership of the Oklahoma Education Association over the past two days and is trying to negotiate a solution to the walkout, but he says union leaders have been unclear about how much money they want. "I'm not going to put a number on it because I've heard five different numbers in the last couple hours." On Tuesday, the OEA said it wanted lawmakers to raise another $50 million in revenue and teachers would return to the classroom. Today, the union is giving educators a worksheet that says 95 percent of it's first year demands have been met. The union is now asking for $25 million more. So far today, the OEA has declined interviews with the media but recently announced union leaders will hold a press conference at 4 p.m. The Oklahoma teacher walkout will continue into its ninth day today, but some school districts have begun calling their teachers back to the classroom. Large districts like Bartlesville and Moore Public Schools will reopen today—but not without a fight. KFOR-TV reports Moore Public Schools held an emergency meeting Wednesday night because teachers were angry with their superintendent’s decision to resume classes. Many educators felt their work at the Capitol was not finished and still want to see lawmakers increase funding for the classroom. Several media reports say some teachers from Moore Public Schools are taking personal leave as classes resume Thursday, leaving school officials to seek hundreds of substitute teachers. On Tuesday, Oklahoma Education Association, the union leading the walkout, rolled back their school funding demands. They are now asking for just $50 million in recurring revenue and they say they'll go back to the classroom. The legislature did not make any movement towards these demands on Wednesday. Copyright 2018 KOSU. To see more, visit KOSU.